ArgoX 2017 Ultra Bar and Lines - Ready to order. The new 2017 Griffin Bar is a 50cm 4-line control bar with a spinning below bar swivel safety release. 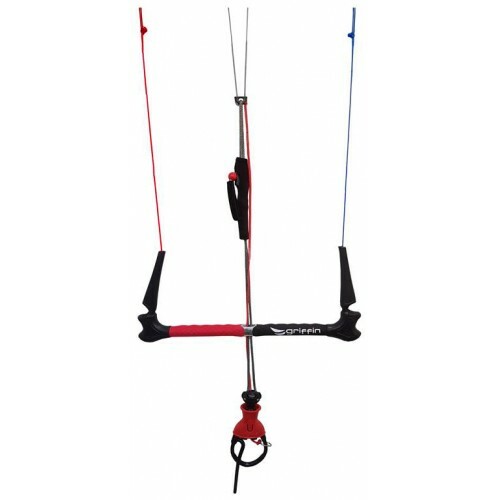 The new bar is designed to be used with All Griffin Kites and any other kite that uses 1 line flagging and equal line lengths. Made of glass-carbon with an aluminum bar hole to be light, resistant and extremely durable. Color coded foam cover and ergonomic grip super comfortable and easy to use. Designers Notes: When designing the 2017 bar, I went through every forum discussion about what makes a perfect bar. it was clear what people agreed on, disagreed on and issues that needed resolving. 1) Never Flap depower strap. The depower strap can Velcro onto and below the cleat or a sliding neoprene sock. 2) Easy to reach depower strap. Extra long, easy to reach depower strap. 3) Long and Short throw bar. 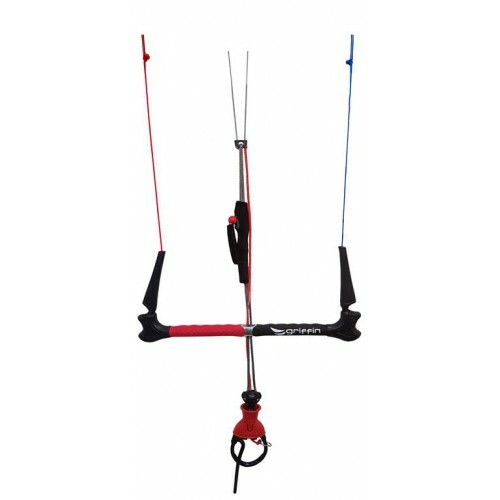 Easily and fast adjustable throw in one bar, long throw for long arms and surfers, short throw for people with shorter arms. 4) Close to bar V split lines. The 2 inside lines split close to the bar in a V setup not a far away from the bar Y Line split. Better for Gopro line mounts and less thick lines. 5) Elastic line savers. Elastic lines at the end of the bar clip over the lines to prevent the lines coming undone and getting tangled. 6) Soft bar ends. Bar ends are covered with injected EVA foam now to avoid you getting hurt if being hit when trying new tricks and make your riding more comfortable. 7) Integrated floaters. The floaters will stay always in their position not going down the lines when folding the bar. 8) Clutter free setup. K.I.S.S - We aimed to "keep is simple" The bar simple and clean. 9) Easy to replace parts. All parts of the bar are easily replaced using parts from local kite and marine shops. 10) Above bar depower. 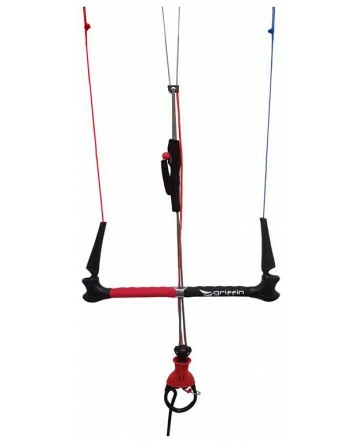 Easier and fast to depower and a more natural way to trim the kite with easy to reach above the bar depower. Designed to be used easily even for people with short arms. 11) Improved Donkey Stick. The Donkey Stick is half bendy and half firm. This greatly reduces the chance of the stick coming out while riding or doing tricks. 12) Natural Push Away Release. An easy to grab push away release makes releasing of the kite much faster and easier. 13) New swivel below the bar. 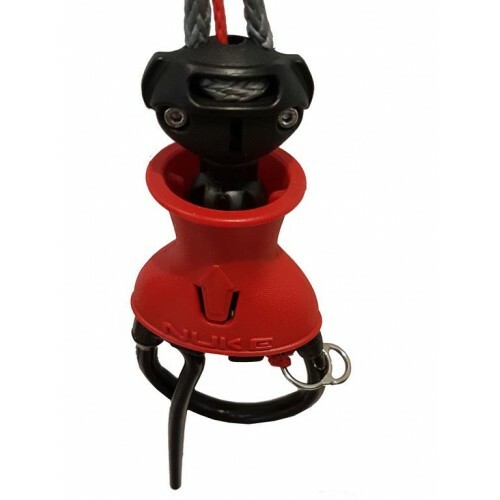 The new swivel below the bar will help untangling your front lines when looping. 14) Below the bar release leash. 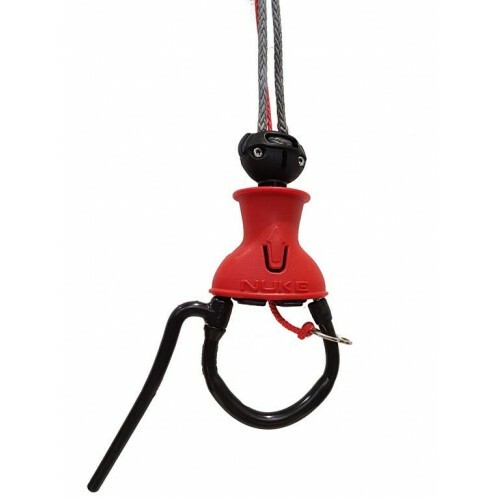 Safety leash can clip into the below the bar ring. 16) Equal line lengths. The bar line lengths are equal lengths when fully powered up. 17) Adjustable steering lines. There are 3 adjustments on kite connectors (pigtails) of steering lines for micro tuning and adjustments to the steering line lengths. 18) Strong Lines. 450kg super strong inside lines with less stretch and more of a direct feel. 350kg outside lines. Stronger lines are less spongy and give a direct feel to the kite. 29) Easy to detach lines. All 4 lines can be easily detached without having to unthread 24m through a hoop. This makes changing lines, untangling, removing seaweed 1000 times faster and easier. Add-ons: There will be a 5th line optional add-on, and a plastic protected center line addon.